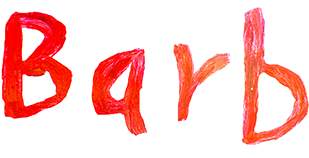 CLICK ON ANY SIGNATURE TO DISCOVER THE STORY BEHIND! 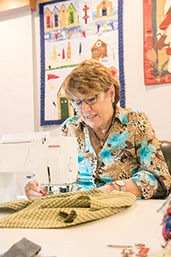 Hilde is one of the most sought after artist in Iowa. She has been in the US for more than 20 years. Follow her though a day in her life. Story Published on Jun 9, 2015. Alex is the official voice of reason behind SignMyCar! 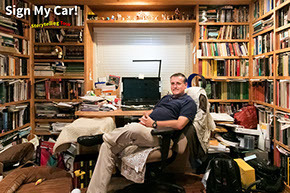 Discover how he got dragged into the project and became the co-producer of SignMyCar! Story published on Jun,22 2015. 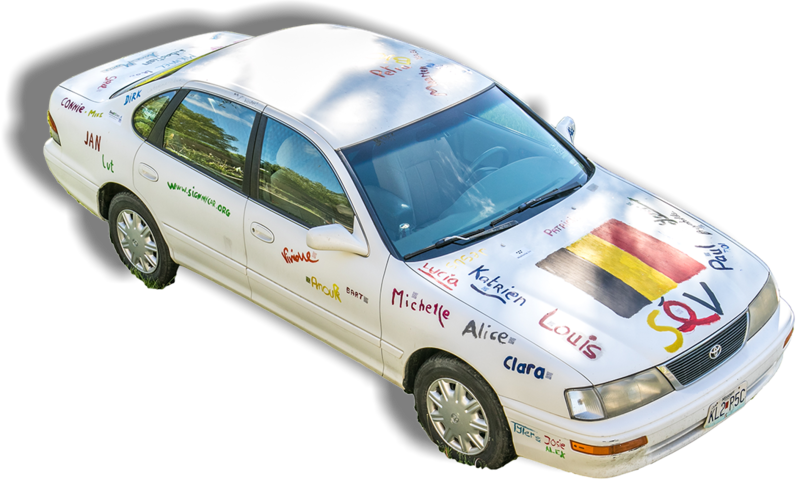 Séverine is the Belgian Photographer behind SignMyCar! She is impulsive, frank and can't stay put in one place for too long. Find out the story of the storyteller. Story Published on Jun 15, 2015. Katrien is the first SignMyCar! participant. She works as an Administrative Secretary for the City of Washington, Missouri. She moved to the US almost 9 years ago. She shares her story and insights in a video interview. Story published on Jun 23, 2015. Louis is the President of the Belgian Club of Chicago. His international career took him all around the world. 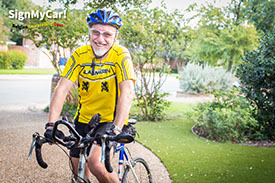 Now retired, he loves spending time with his family and taking care of his 13 grandchildren. Paul is the Honorary Consul of Belgium in Chicago. He is also the International Sales Manager for a big firm selling nut snacks. Follow Paul to an official diplomatic event. Story published in October 15. Lize has been in the US for about two year. She moved to Michigan to be with his husband. They just celebrated their first anniversary. Follow her through a day in her life and watch her video interview. Yanik is passionate about technology. He has lived on 4 continents and spent his childhood in Australia and Congo. He has been in the US for 15 years and recently got engaged. Discover his life story in a video interview. Story published on Jun 22, 2015. Christine is an teacher assistant for kids with special learning needs. She has been in the US for more than 20 years. She enjoys crafts and gardening. She finds joy in quiet and peaceful activities. Story Published on Jun 16, 2015. Rose Cnudde De Buyssher moved to the USA in 1971. She worked for 35 years in the field of Reproduction and Women's Health. She shares her 45 years of experience abroad in a wonderful interview. Story Published in August 2016. Marleen De Waele-De Bock is a renowned painter in Nashville. She moved to Tennessee in 2001 after two other expatriations in Africa. Patricia Kalmeijer is a Realtor and Relocation Specialist from Leuven. She is the main organizer of beATL, the Belgian Club of Atlanta. Petra Van Der Linden and her family live in Jacksonville, Florida. I followed them for a week and interviewed each family member. Click on these signatures to discover their American life under the light of intergenerational perspectives! Kenniesha is a full time YouTuber! Kenniesha is Belgian African American. Her husband Bünyamin is Belgian Turkish. They moved to Florida in 2014. 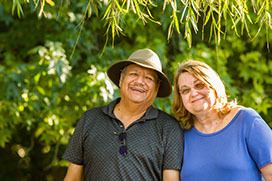 As a interracial, intercultural and interreligious couple, they wanted to find a place to belong to and start a family. Bünyamin moved to Florida to be with his wife, Kenniesha. They both grew up in Antwerp. But as a interracial, intercultural and interreligious couple, they wanted to find a place to belong to and start a family. Bünyamin's interview talks about growing up as a first generation Belgian and finding his place in the US. Did you know that Walloon is spoken in Wisconsin? Find out how the Walloon language arrived in the United States! There are only a handful of speakers left and the community is fighting to preserve their language. Professor Kelly Biers and Professor Ellen Osterhaus talk about the tools and strategies available to save not only the Wisconsin Walloon Dialect but all endangered and indigenous languages! This is the first installment on our series "Wisconsin Walloons". Did you know that some parts of Wisconsin still hang on to their Belgian Heritage? In the Door Peninsula, many towns are named after Belgian cities! SignMyCar! went to Brussels, WI in August 2016 to find out more! This is the second installment in our series “Wisconsin Walloons”. Meet Sandy Orsted, treasurer at the Belgian Heritage Center. She will tell you all about how an upsetting event turned out to be a real wake call for Belgian Community. They are now organizing to professionally preserve their Walloon heritage and save their language! The first Belgian settlers in Wisconsin were devout Catholic. They built tiny chapels on their homestead properties. Roadside chapels are a unique landmark in the Namur Historical District in Wisconsin: you can not find those anywhere else in the United States! In this third installment on the Belgian Heritage Center, I follow Barb Chisholm, Historian, to find out more about the religious origins of the Belgian settlements! This is an exclusive photo story for the reader of SignMyCar! Emily is an athlete, a real estate agent and a animal rescue volunteer in Dallas, Texas. She moved to Texas to be part of the swim team at SMU. She is Belgian, Greek and now also American! I followed her for a couple days of HIIT training, house hunting and cute dog cuddling. 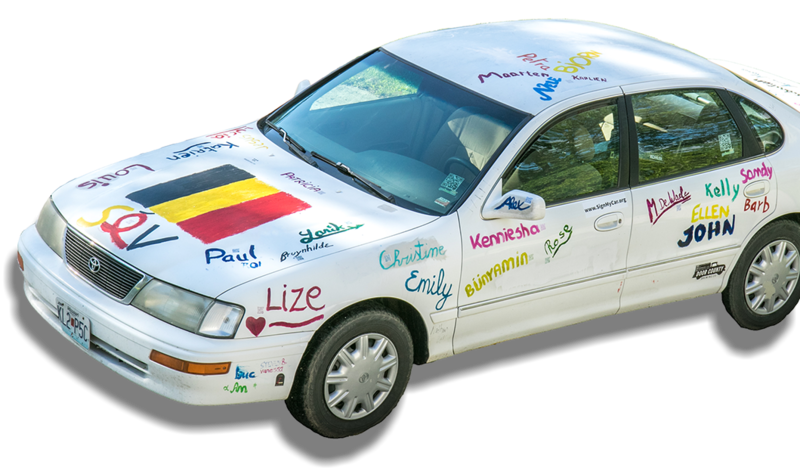 Ann Maria and her husband Luc are SignMyCar! supporters. They pretty much gave me the key to their house so I could rest for a few days with them :). This is an exclusive short story for SignMyCar! readers. Katrien is the first SignMyCar! participant. She works as Administrative Secretary at the City of Washington, Missouri. She moved to the US almost 9 years ago. She shares her story and insights in a video interview. Clara Brocken moved to the USA in the summer of 2005 after meeting with a guy that kept busting her out of jail... on bootleggers.us! Now that's a unique story! Listen to her video interview and watch her photo documentary! Alice is an Assistant Professor in Economics and Demographics at the University of Iowa. Besides loving her academic field, she is also the proud mother of Michelle. Michelle is the adorable baby daughter of Alice. She loves Cheese, sleeping, the color pink and playing with her parents. 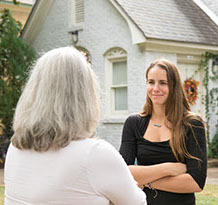 Viviane Hens is a Professional Counselor in Atlanta, Georgia who specializes in body psychotherapy. Sebastian is Anne-Marie's son. He is extremely intelligent and passionate about architecture. He is in his last year of High School and volunteers for the Frank Wright Preservation Trust in Oak Park, IL. Story published in October 2015. Anne-Marie is a Researcher at Rush University in Chicago. Her specialty is Rheumatology. She adores books and the feel of paper in her hand. In her free time, she enjoys traveling with her family. Leentje is a Belgian journalist and tour guide based out Chicago. She is a very active member of the Belgian Community in Chicago. Michael is a Jewelry Designer in Chicago. He has been living in Illinois for more than 15 years. Throughout his life, he has operated several businesses and has become a seasoned entrepreneur. Leon is Leentje's son. He loves reading, playing football (soccer) and watching hockey. He is raised in both Flemish and English. Christel moved to Michigan almost 6 years ago. She worked as a nurse in Belgium. A couple years after moving in, she was diagnosed with breast cancer. She has now recovered and spends a lot of time taking care of her family. Story pubished on Jun 25th, 2015. 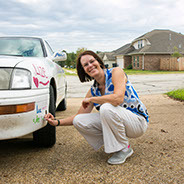 Kristine is a SignMyCar Supporter. She hosted me for one night on my way to Florida. Steve Katlin spent his childhood between the East Coast and Belgium. After a long and successful career in Tourism, Steve became a licensed Pet Care professional. His nickname is “the DogFather”. Ever you ever wondered what it feels like to live your passion in a very remote part of Texas? The Ally Family has a dairy farm there with more than 2000 cows! 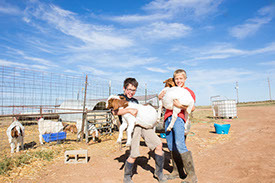 Get in their shoes and live the farmer's life for a while! SignMyCar! is a super cool project but it is labor intensive! 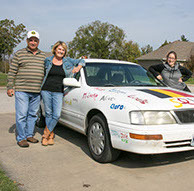 Connie and Mike Hernandez are part of the people who help SignMyCar! during our lengthy post-production process! Here is a portrait of our sponsors :)! Jan was born in Bilbao, Spain and raised in Leuven, Belgium. He lived 20 years in France and the United States. Needless to stay he know multicultural! He is a top Executive at Texas Instrument. We are so lucky we were able to interview him. His video interview is one of our favorites! Lut De Meulder is very generous and loving of others. She takes part in many fundraising and volunteering projects across Dallas with a focus on French Expat and French language groups. Even though, she was raised in Flanders, she lived more than 20 years in France. In her free time, Lut does patchwork. Follow her into this underrated fascinating world! Dirk is one of the most instructed person I have met in my life. He moved to the United States to pursuit his passion for Maya and Pre-Columbian civilizations. He is now the Curator of Anthropology at the Houston Museum of Sciences!!! He took me behind the scenes at his museum. Follow Dirk through a few days of his life! 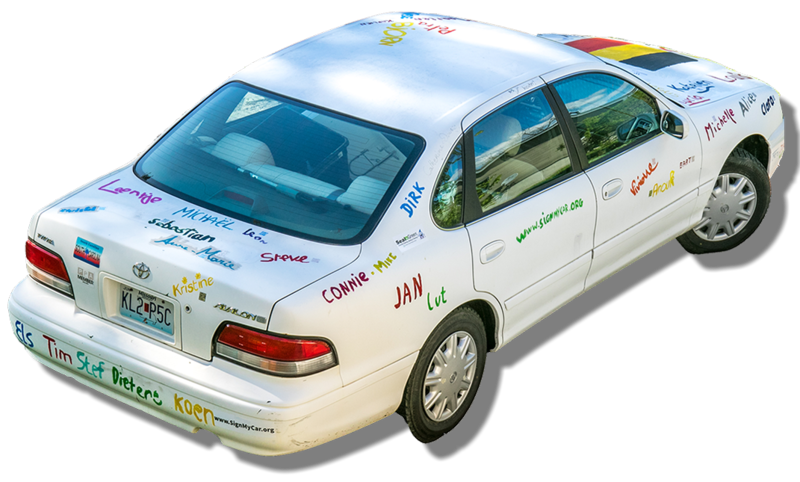 Mariejose and her husband are SignMyCar! supporters. They are the last people I met during the production of Season 3. They took me to a go-to destination in Missouri for a well deserved night off! Branson is called little Las Vegas around here. You will understand why!